I’m in Cuba with no internet access! I’ll check in if/when I can, but in the meantime, enjoy this post from my archives! Heee. 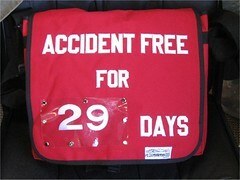 The numbers are attached with double-sided tape and behind a removable pocket of PVC, and there’s a pouch with additional numbers in the bag so I may always be up-to-date in my accidental ways – it has, in fact, been 29 days since I last found down. I unveiled the bag last night to much appreciation, although so far today all I’ve gotten is a blank stare of incomprehension from the yuppie standing behind me in Capers with her box of organic wheat-nut crackers and soy juice. I love my new bag. It tickles me in many fantastic ways. This does bring up a valid question, though – what constitutes a true accident in my world? It’s not black or white at all; it’s a grey area muddled with contusions and viral strains of Manhattan-style herpes. Drawing from chapters of my own life, I’ve devised a guide of sorts – a scale for keeping track of Perilous Kimli. The first items on the list are minor and/or not a) leaving marks, or b) requiring a hospital/doctor visit. Below the break point are injuries that either left a mark, required a doctor, or are just so insane – see numbers 6, 7 and 10 – that they have an epic back story and will be told to my friend’s children for generations to come as an example of why they ought to stay in school and graduate. Hopefully this list will help the average Joe determine what is and is not considered an accident in the Perilous World of Kimli. I am either amused or scared that it was way, way too easy for me to come up with 12 separate incidents with which I could build the scale.